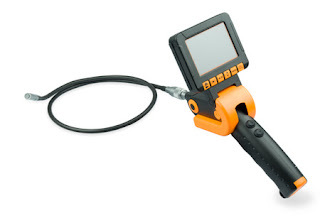 Voyager Video Borescope Systems are great for basic industrial applications which require a portable inspection device to capture images and video. The 5.5mm (0.22”) or 11mm (0.44”) diameter probes feature a flex and stay, semi-obedient design to complete inspections in automobiles, pipes, walls, industrial machinery, plumbing, duct work, construction sites, and any other areas which are difficult to access. These portable Voyager Videoscopes feature inter-changeable probes, with various diameters and lengths, to access a wide range of inspection areas. Each probe features a CMOS Video Camera chip in the tip, which produces a live image displayed on the portable 3.5” TFT LCD Monitor, which will capture 720 x 480 pixel JPEG images, and AVI video recorded at 30 frames per second, with a defined focal range of 20mm (0.8”) to 280mm (11”). The portable monitor features an ergonomic design, with an adjustable screen which stands up or lays flat against the handle, and a handle that can also move from straight out, to down 90 degrees, for comfortable inspections at different angles. Additional features for these units include 4 LED lights to illuminate the inspection area, with intensity control buttons on the handle, a 2 GB SD memory card for file capture, a USB port to transfer captured files to a computer or laptop, video output to export the live image from the portable monitor to a larger TV, a microphone to record findings, and power supplied by 4 AA batteries, which last for up to 3 hours of portable use. A set of tips is also included with each set, including a mirror tip, hook, pin and magnet.